Synopsis: The trip of a lifetime. Jenna Boller can sell anybody anything. She's the best employee at her branch of Gladstone's Shoes. But her family problems are harder to handle, and there are times when Jenna wishes she could just take a break. So when Madeline Gladstone, the elderly president of Gladstone Shoe Stores, hires Jenna as her chauffeur for the summer, Jenna leaps right into the driver's seat. And that begins a cross-country adventure, where she and Mrs. Gladstone learn a lot about the rules of the road...and the rules of life. I think this is one of those books that every teen should read. It's simple, cute, and short, but really packs a punch with important messages that a lot of books avoid. Jenna's dad is an alcoholic - he comes and goes in her life, but whenever he's around, she knows there's going to be trouble. She's spent her whole life feeling responsible for him, trying to take care of him and make sure that his problems don't affect her younger sister, Faith. When Jenna's given the opportunity to leave town for six weeks, she can't wait to go. She learns many lessons along the way about herself, her family, and life in general, but one of the most important lessons she learns is that no matter how far you go, you can't escape your past - it's a part of you and will follow you wherever you go. Jenna is a great character. She's funny and clever, kind of quirky, and very relatable. She's not beautiful or popular, she doesn't have many friends, she just is who she is, and she doesn't apologize or make excuses for that. She makes friends in the most unexpected ways with the most unlikely people, but those people teach her a lot and change her in ways she never expected. "You know the thing about hope, how it sneaks up behind you when you're sure everything's in the toilet, and starts whispering to you that maybe, just maybe, things could turn around." "You never know where the road's going to take you. I think sometimes it's less important that you get to your destination than the sidetrips you take along the way." "Now I see that it isn't the problems along the way that make us or break us. It's how we learn to stand and face them that makes the difference." 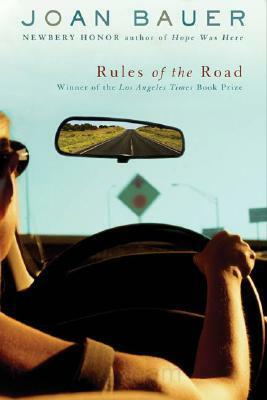 I'm anxious to find out what happens to Jenna in the sequel to Rules of the Road, called Best Foot Forward. Thanks for this review! I always am looking for a good contemporary to read!